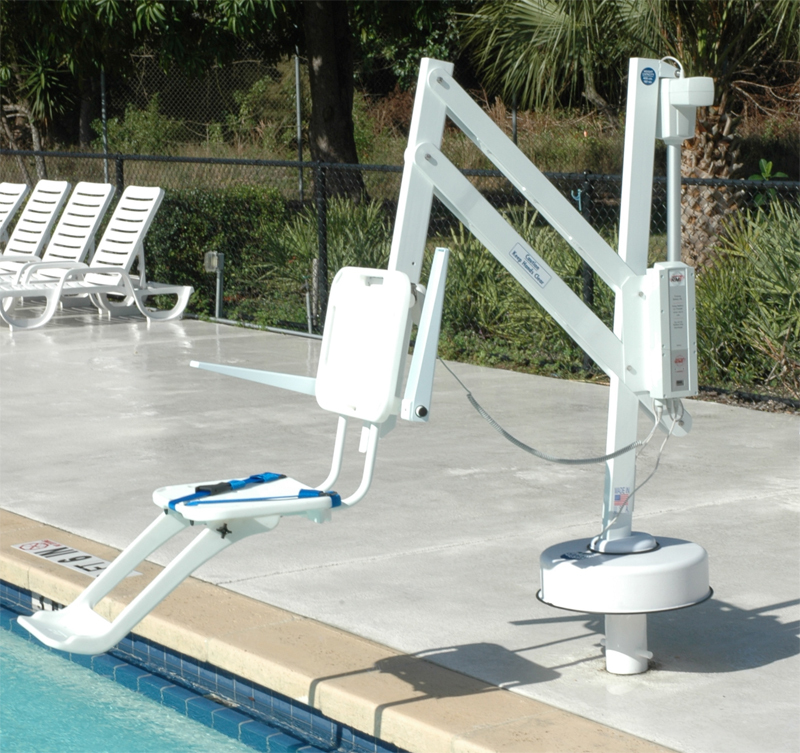 The Splash is a semi-portable pool access lift which has been in production for more than 20 years. Designed originally by Martin Thompson, the founder of RMT Pool Lifts, and recently manufactured in the US by SR Smith, the Splash is one of the most popular pool lifts that has ever been made, having been sold all over the world. The Splash! Lift series meets the Americans with Disabilities Act Access Guidelines (ADAAG 2010). In addition to the standard configuration, the Splash! lift is also available in Hi/Lo, Spa, Extended Reach, Splash! 300, Splash! 300 Hi/Lo, and Splash! 300 Spa versions. Specifications: 181 kg (400 pound) lifting capacity, except for the Extended Reach which has a 136 kg (300 pound) lifting capacity. Powered by a 24-volt rechargeable battery. Powder-coated stainless steel and aluminium. The Splash is virtually maintenance free. The components are made from corrosion-resistant materials, including powder-coated aluminium (arms), and powder-coated stainless steel (base, mast, and seat frame). The unique rotomolded seat of the hoist was specifically designed to provide the user with the greatest possible safety, comfort and ease of transfer. The extended reach Splash is used for pools that have a gutter or channel. The Splash Hi-Lo pool lift is used in locations with in-ground pools and raised spas or walled pools which require a longer reach than a standard Splash Hi Lo. The Splash Spa pool lift has been designed for raised spas and above ground pools. The standard Splash pool lift configuration. The Splash! 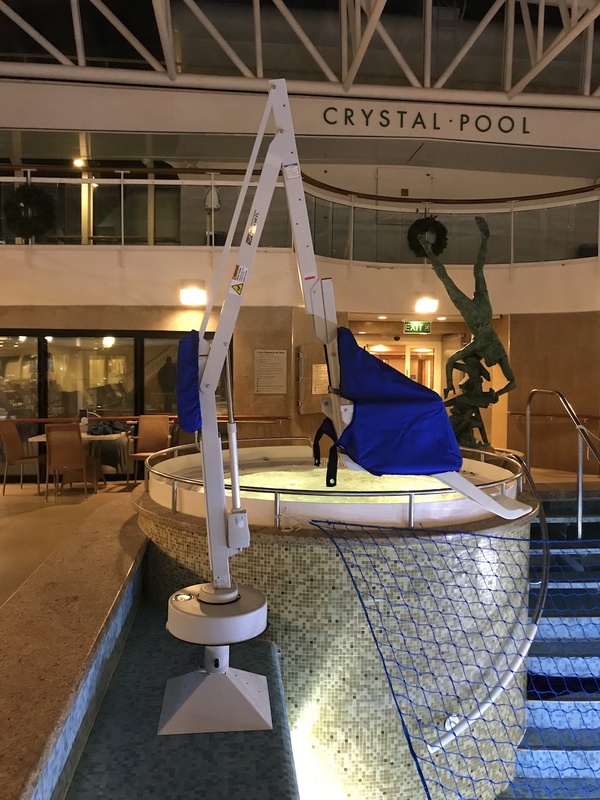 is available in a Spa version for use with above-ground pools and spas; a Hi/Lo version for facilities with both above-ground and ground level pools and spas; and an Extended Reach version for facilities with longer deck to water requirements. The Splash! lift installs into your pool deck via the supplied deck anchor, and can be easily removed for winter storage using the Splash caddy. The Caddy is designed to facilitate lifting the Splash! out of the deck anchor and also serves as a storage rack when the lift is not needed. 344° rotation ensures a safe transfer area. The Splash! Lift series comes standard with the LiftOperator® Intelligent Control. Regular maintenance will prolong the life of your Splash Pool Lift. Keep all electronic components clean and dry. Keep the Console/Battery Cover installed at all times to prevent moisture from collecting on the Control Box and battery. Excessive moisture collection can affect battery and lift performance and could lead to battery failure and/or the lift failing to operate. If the lift is used outdoors, optional covers are available and recommended.